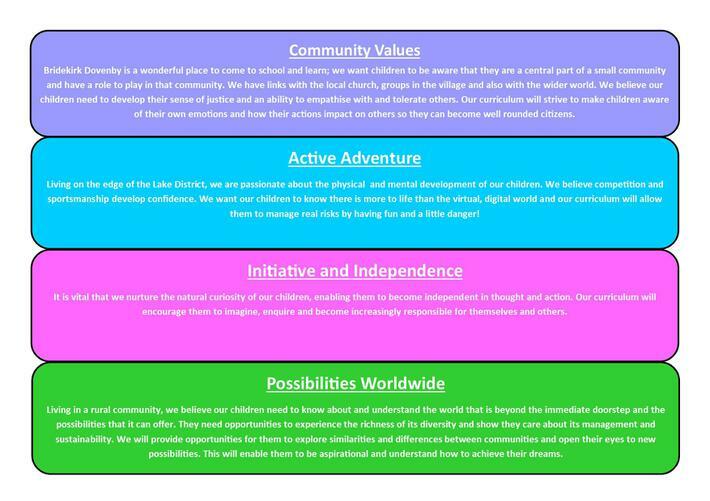 Together we have decided upon the following CURRICULUM DRIVERS which underpin the decisions we make about the curriculum and ensure our curriculum offer is enriched and personalised to the children of Bridekirk School and their families. · The location of our School. Grammar and Punctuation is taught throughout the school using a mixture of appropriate resources, with the NO NONSENSE GRAMMAR & PUNCTUATION as the main scheme. Spelling is taught according to the National Curriculum, but NO NONSENSE SPELLING is used a whole school scheme. Improve quality, speed and stamina of their handwriting. Have full knowledge and ability of the different forms of handwriting for different purposes. Children starting school are encouraged to look at books, talk about them and share with others, so that they reach an early understanding of what reading is about. They are taught certain skills, visual and auditory and then, through the use of models, pictures, maps, etc., a sight vocabulary is developed of words from a variety of reading schemes. Parents are encouraged to help to reinforce and add to their child’s sight vocabulary by playing word games at home using the lists provided. All children receive a reading book to share with their parents / carers, so that they learn to enjoy books from an early age. In conjunction with the approaches outlined above, the children will experience a daily phonics session using various schemes to implement ‘Letters and Sounds’. Phonics is also taught daily in KS1 so children are well prepared for the screening check at the end of year one. Reading is also taught in Guided Reading groups, where the children have a copy of the same book and read it together as the teacher guides them through it and teaches them varous reading strategies. As the children’s reading ages rise, they become less dependent on the formal reading scheme books. Therefore, the scheme books are phased out and the children are encouraged to choose reading material from selections of books in the classroom. We hope to instil in the children a love of reading and higher order reading skills: - reading between the lines, skimming, scanning, inference, deduction, prediction exercises and library skills are developed as the child progresses through the school. Children’s reading progress is monitored and recorded in an individual Reading Record. We have purchased a computer system to monitor reading accuracy and comprehension of books from Year 1 onwards. Accelerated Reader quizzes are proving to be both stimulating and enjoyable. Recent developments include vocabulary assessments and online monitoring for parents.